Go Ahead, Imagine a Jump! I was just checking my site stats and I was a bit surprised to find out that there’s still some people visiting my blog, even though I haven’t been writing for a while now. Probably some of them are relatives and friends coming here to check what I’m up to. But there are also random people who end up here while searching for “euromast”, “euromast rotterdam zipline”, “abseilen euromast”, “euromast tower gliding”. And searching for that, they find this. It’s interesting how that is my most read post of 2011. Well, it was Freshly Pressed (yay! ), so it’s not that strange that so many people had read it. But it’s funny how they still find out about it, just searching stuff on Google. So I went back to that post and I read it one more time. And even though one of the things I should learn to do is to stop looking back and look forward, I think that I can and should look back at the feeling of that day. How I was feeling scared, but how I was able to overcome my fears, do something I was afraid of, and enjoy it! I should always keep that in mind. Specially when I feel scared of doing something, which is quite often. Overcoming fears is also the theme of a blog I’ve recently started following. Since I first read it I could see a lot of myself on what it was said about feeling anxious, scared and insecure. But even though I read and relate to it, I have never left a comment. I don’t know exactly why…no, actually I do. What stops me is that I think that whatever comment I may make, it can’t be that interesting. Or something like that. How silly, right? So what to do about that? Well, first of all leave a comment there. And then let be inspired by that blog’s example. I know for a fact that the world outside your comfort zone can be full of surprises (most of the time nice ones ;-)). As I let myself (not so gently!) fall from the Euromast, I might as well jump once again out of my comfort zone and see what I find! I keep making plans and to-do-lists, but apparently I’m not able to actually do things and be productive. I don’t know exactly why, but lately I find it dfficult to concentrate and focus. Anyway, while I try to tell myself that I’m not completely useless, I managed to (almost) finish the blanket I was working on. I’m saying almost because it’s a bit small for a blanket. It’s about 60×54 cm. I guess I shouldn’t call it a blanket. That’s how it looks like so far. In the picture it doesn’t look that tiny, but…it is! I should probably buy more yarn and try to make it bigger. 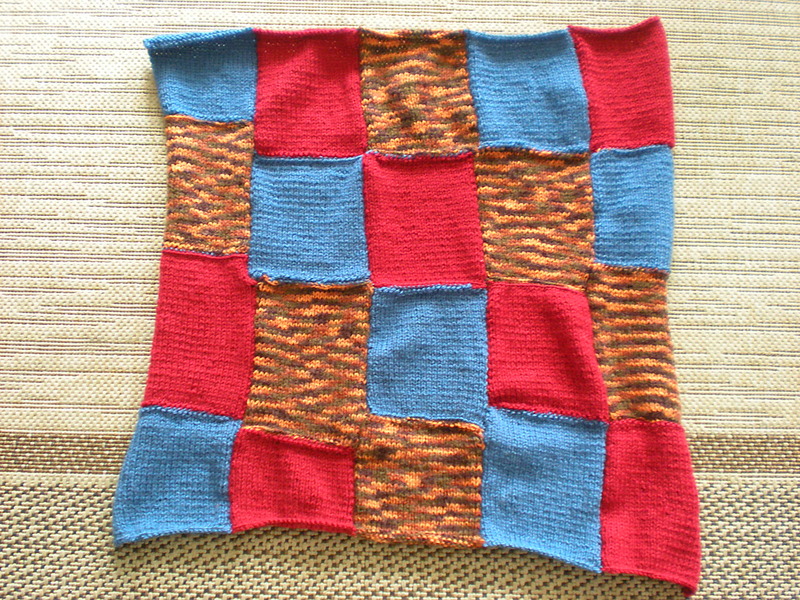 I was thinking of knitting a frame around it, all in one colour. Maybe dark blue. Also, it’s been months that M. and I keep telling each other that we should go for a run once in a while. Possibly every other day. But then we keep making excuses: today I’m tired, now it’s raining (living in the Netherlands, this is an excuse you can use quite often! ), I’m starving let’s make dinner we’ll go for a run tomorrow, and so on. Monday was a hot sunny day, perfect for a run. Well, actually it was too hot…but no! No more excuses! Let’s put on your running shoes and let’s go. We walked to a canal just outside the centre of Delft, and started running along the canal. We ran for a few minutes, and it was quite nice. Rowers were passing by, people were enjoying the sunshine sitting on a bench, there was also someone swimming, and kids jumping from a bridge into the water. We ran for a while, then walked, and then ran again. Until I began feeling exhausted and I was mostly walking than running. My body was like “OK, walking is good. What? You want to start running again? Bwahahahah!! !” Alright, I guess that’s enough for today! Last night we went running again, even though we almost had an excuse not to go. A storm is a good reason to stay home and watch TV, isn’t it?! But there was nothing on, and after a while it stopped raining, so we went out. It was a completely different atmosphere from the night before: the sky was still gloomy, it was windy, and there were not many people around. There were still some guys swimming in the canal, even though it was not that warm. We were alternating running and walking. And again, for me it was mostly walking! I guess I have to go for a run again tonight, and see if the bridge is still there or ran away! I’m still here. I didn’t forget I have a blog! I was just affected by a severe form of procrastination 🙂 which made me think “Mmm, I’m not writing today, I don’t have anything interesting to say. Maybe I’ll write something tomorrow”. Enough of it! Tomorrow is today! I always tell myself that I should make a plan and stick to it. So here’s the plan: I’m going to write (and post!) something everyday for the next 30 days. Will I be able to stick to this plan? I will tell you in a month!